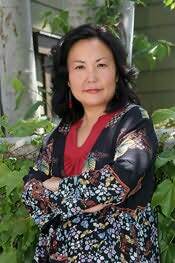 Naomi Hirahara, born and raised in Southern California, is the Edgar Award-winning author of the Mas Arai mystery series, which features a Japanese American gardener and atomic-bomb survivor who solves crimes (SUMMER OF THE BIG BACHI, GASA-GASA GIRL, SNAKESKIN SHAMISEN, BLOOD HINA and STRAWBERRY YELLOW). MURDER ON BAMBOO LANE, her new mystery series with a female twentysomething LAPD bicycle cop, was released with Berkley Prime Crime in spring 2014. Her next in the series, A GRAVE ON GRAND AVENUE, will be released in April 2015. A former editor of the largest Japanese American newspaper in the U.S., she also has released a number of nonfiction works. A number of her short stories have been included in various anthologies. "This spot will soon be filled with high praise from an acclaimed and Edgar Award-winning writer of two mystery series."